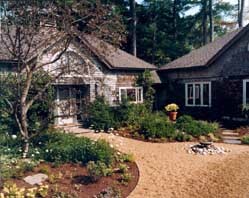 Entry Courtyard: Borrowing the original Edith Wharton concept of a heavily planted forecourt, the design removed the vehicles and reinstated its New England style plantings. Distant View: While seated on the front stone stoop, the owners can now view the lake without seeing vehicles. 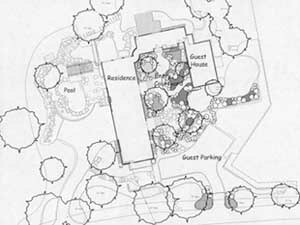 Full-service master plan and design implementation services were provided by WCA in collaboration with Clark & Green, Inc. 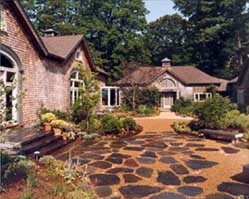 Since purchase of this historic Edith Wharton Ice House and Horse Barn in 1992, the owners have converted these buildings into a dramatic living space. The newly renovated Horse Barn with its casual rustic character and striking appointments set the tone for a garden design, which incorporates the spirit of its historic roots. 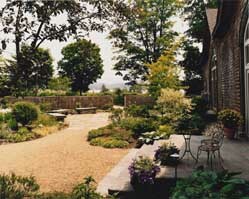 The existing strengths and elements of the property guided the garden’s evolution and provided subtle visual anchors. 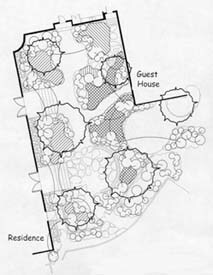 Several 150-year-old Maple trees, a dynamic topography, meadows, pond and distant views all contributed to the final garden design. Pool with a view borrowed, off- property views of a neighboring pond and rolling hills give this modestly sized garden/pool area a sense of grand expanse. 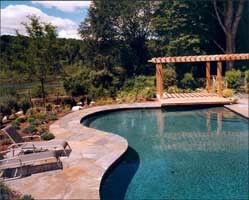 Guest Entry: Guests may come and go as they please without intruding on their hosts. Dynamic composition. 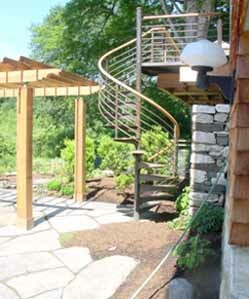 The contrasting character of steel, wood, stone and plants provide visual interest to the south terrace.